ARIES (March 21 – April 19): The most important thing for you to remember this week is that the semester is almost over. There’s probably no way to save your grades, but you might be able to sweet talk your professors into at least passing you IF you show up to class and act like you know what you’re doing. Maybe … but probably not. TAURUS (April 20 – May 20): Your professor will spring an excruciating pop quiz on you this week, which means it’s time to put those bullshitting skills of yours to the test. Might want to Google some information beforehand, though, to boost your luck. GEMINI (May 21 – June 20): Under the mountains and mountains of things you have to do these next few weeks, it is amazing that you are coping so well. You have managed to only snap at someone you actually enjoy the presence of only once! You should be proud that you’re handling things so well. LEO (July 23 – Aug. 22): Your friend might be under a lot of pressure this week, so maybe surprise them with their favorite tasty treat! Don’t be alarmed if they start crying into that strawberry milkshake, though. They just haven’t slept in two days and it’s starting to get to them. VIRGO (Aug. 23 – Sept. 22): You know that person in your class that is constantly answering all your professor’s questions? Maybe it’s time to cozy up to them and see if you can snag some great notes to study with for finals week! LIBRA (Sept. 23 – Oct. 22): You’ve made some poor choices this semester. While partying is always way more fun than studying, you are now left facing the consequences of all those parties. Honestly, there’s no point in trying anymore. Just accept your fate and try to make better choices next semester. 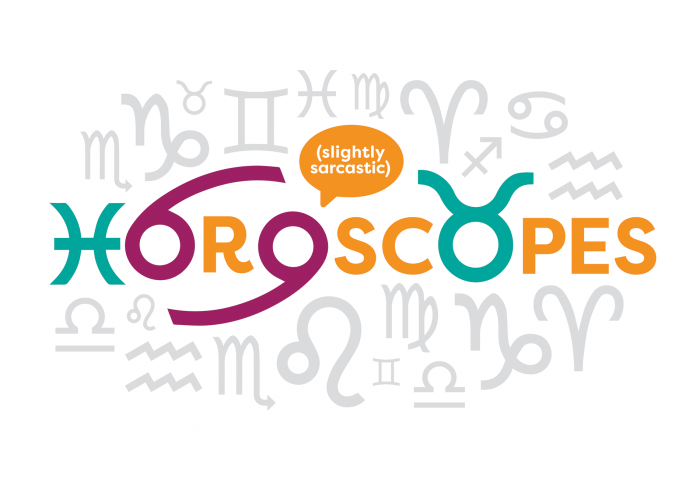 SCORPIO (Oct. 23 – Nov. 21): Remember when you were in high school and you were the teacher’s favorite? You could do no wrong. You slid right through classes. Yeah, well, college professors are way less nice. Stop trying to skate by on compliments and jokes. You’re still going to have to take the final. SAGITTARIUS (Nov. 22 – Dec. 21): Maybe it’s time to finally open those textbooks. You’ve managed to go to class, but now the professor is expecting you to actually know the material too. CAPRICORN (Dec. 22 – Jan. 19): It’s no secret that you’re stressed out. Maybe find a good way to release some of that? Try a massage. Or exercise. Or get really drunk. Or get really drunk and flirt with that hottie you’ve been eyeing. What’s the harm? AQUARIUS (Jan. 20 – Feb. 18): Someone might approach you soon. They might be wasted. It will probably be the middle of the day. Try to be kind; you never know what they’re dealing with. PISCES (Feb. 19 – March 20): There will suddenly be, like, 50 people in your class that you’ve never seen before — which is odd because your professor has taken attendance all semester. You just assumed you were in a class of 12.